The presidency of Seattle Pacific University was Daniel J. Martin's dream job. With a JD, MBA, and two EdDs, he had served as a university administrator for 18 years and was currently the president of Mount Vernon Nazarene University in Mount Vernon, Ohio. 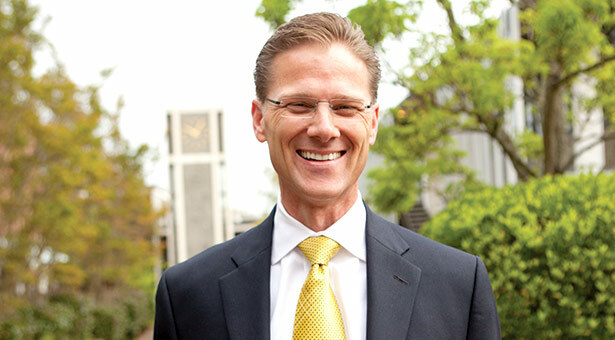 Martin was named president of Seattle Pacific in April 2012, and took office on July 1 following the retirement of President Philip W. Eaton. Let's begin with the question we asked our readers in this issue of Response: What did you want to be when you grew up? In grade school, I wanted to be an architect. My mother is an artist, and my father is an engineer, and they were always remodeling homes and old farmsteads. I loved to draw pictures of houses and floor plans on graph paper. Both the detail and the creativity of architecture appealed to me at that age. Of course, my ideas changed over time, but I've always been drawn to the balance of the science and the art of a profession. In high school, I felt called by God to some type of ministry. I didn't believe I was called to be a pastor or youth pastor or what people typically framed as ministry in those days. I just knew that my calling was to serve others and to create positive change. "SPU's mission is not only the essence of what a Christian university should be about; it is also the essence of my own calling." When did you first know you wanted to become a university president? I was 20 years old and an undergraduate student at Southern Nazarene University when I began to see that I might be able to make a difference in Christian higher education. I loved — and still love — the intellectual and creative energy of a campus, and the way in which student dreams are shaped and fostered here. As time went on, I saw that my particular skills were best suited to the administrative side of higher education, and I set my sights on becoming a university president. What attracted you to the position of president at Seattle Pacific University? There's so very much to be attracted to here. I have high respect for the extraordinary quality of the faculty and the strength of the academic programs, and for SPU's commitment to outstanding education informed by Christian faith. I admire the rich tradition and history of the place, the accomplished students, the diversity of the community, the beautiful urban setting — I could talk all day about the qualities that would be attractive to any prospective president. But I was first and foremost drawn to Seattle Pacific's mission to engage the culture and change the world, and to the tremendous capacity this university has to fulfill that mission. Of course, the reason SPU is in this position, the reason it is thriving, is because of the extraordinary leadership and passion of my predecessor, President Philip Eaton, combined with a history of gifted faculty, staff, administrators, and board members. Do you see your work as president of SPU as an expression of your faith? I have certain gifts and abilities that God has blessed me with, and I believe I've been called to use those to help meet the world's needs. For me, that work is not at the street level, but in providing students with an education and challenging them to discover how they, whatever their profession, can engage the culture and change the world. That's why SPU's mission means so much to me. It is not only the essence of what a Christian university should be about; it is also the essence of my own calling. Not everyone will have such a clearly identifiable expression of their faith in their work. If I had gone into law or business, the dynamics would have been very different. But it's really about fully living out your faith, and fully identifying with Christ and his call on your life, in all that you do. It's early in your tenure at SPU, but are there two or three priorities you've set for yourself as you begin the job? I want to engage the SPU community, including our alumni and friends, in a conversation to envision how the University will advance its mission in a world that is rapidly changing — and then create a strategic plan that will enable us to achieve the future we envision. I also want to create an organizational model at SPU that places the focus on our mission and on the student experience as central to everything we do. Specifically, I have launched a search for a provost to lead the team of individuals that directly influence the student experience. And one of my highest priorities is to build relationships and partnerships that will bring resources to SPU in support of academic programs, the student experience, and new and enhanced facilities. What do you think is the next great opportunity for SPU? I believe there is an opportunity for SPU to imagine and design a distinctive and leading educational economic and delivery model. The goal would be to sustain the institution's core values of student-faculty interaction and community while reshaping our infrastructure and paradigms to provide greater accessibility and affordability. We'll be talking much more about this in the future, but the point is that SPU can be a leader in addressing some of the challenges facing higher education today. You are on a new campus and in a new city. What are your family's secrets for adapting to your new environment? Explore, wander, experiment, experience. We are looking forward to experiencing all that the Northwest has to offer: hiking, skiing, water sports. And we were eager to return to a more urban environment. Seattle is wonderfully diverse with lots of energy — not just things to do, but things to stimulate the mind. We also love campus life. From the time our two boys were little, so much of our life and activities as a family has revolved around a campus. It's been a great experience to live this life together, rather than having a bifurcated experience, where I'm off doing my job and they're off doing something else. Where do you think you will find inspiration for your work in the months ahead? I find inspiration in many places. But I like people, so one of the primary places I find inspiration is through conversation — whether it's with faculty members talking about their programs or students telling me their life dreams. I'm especially looking forward to making connections with SPU alumni and friends and hearing their stories. That energizes me; it's the result of the work we do every day.